What’s better than waterfalls? Secret, peaceful, and undisturbed waterfalls! There are so many things to do in Jamaica, so we’re glad we had Real Tours Jamaica to guide us. We had already visited Dunn’s River Falls with RTJ, but when Norris suggested we also visit some “secret falls,” we couldn’t say no. We had already spent hours with Norris and by that time he had an idea of the types of things we wanted to see and do, so his suggestion was perfect. Again, RTJ proved to be all about their customers’ experiences and ensuring they have a great time. Off we went to Chuck Norris’ Secret Falls. We went up and around winding roads; it was definitely more “off-the-beaten-path.” It’s located outside of Ocho Rios, and the falls also go by the name of Blue Hole and Island Gully Falls. Compared to Dunn’s River Falls, Norris’ Secret Falls are more low-key and less touristy. When we arrived, Norris introduced us to Dante, who would be taking us around the different falls and pools. Dante also carried my camera, so we could enjoy ourselves and get pictures taken of us. Dante took us to different waterfalls, showed us caves, and even encouraged us to jump off some cliffs. I was feeling very brave that day, and surprised myself by jumping off multiple cliffs, crawling through tight spaces, and even swinging off a rope into a pool. Have you ever gotten a waterfall massage? About to swing like Tarzan! We had a lot of fun splashing around and swimming in the pools. And Dante was so careful to make sure we never slipped (it helps to have good water shoes) and reassured us any time we hesitated a bit with the jumps. Norris had made sure we were in very capable hands. We were sad when it was time to go, but so happy that we had gotten a chance to explore this hidden gem. RTJ’s personal touch and commitment to their customers led us to book even another tour with them the following day to the Rose Hall Great House. So not only was it great to experience the picturesque waterfalls and refreshing pools, but it was also awesome to do it with people that felt more like friends than guides. I haven’t been to Jamaica but I love learning about new (and incredible) places. I don’t think I would be brave enough to jump off the cliffs but I would be more than happy to sit underneath the falls. Hi Kerri! It can be a bit scary, but everything is at your own pace. Everyone was really nice and supportive, so you don’t have to jump if you don’t want to. Well, not so secret anymore is it? 😉 Looks absolutely stunning, peaceful and like a blast though. And seriously, your guide’s name was Chuck Norris? LEGENDARY! This looks like so much fuN!! Dante is certainly getting a little close to my sweet Vicky. LOL I have heard bad things about Dunn’s River Falls so glad you found something that delivered a great experience. I will keep that in mind in case I ever return to Jamaica. 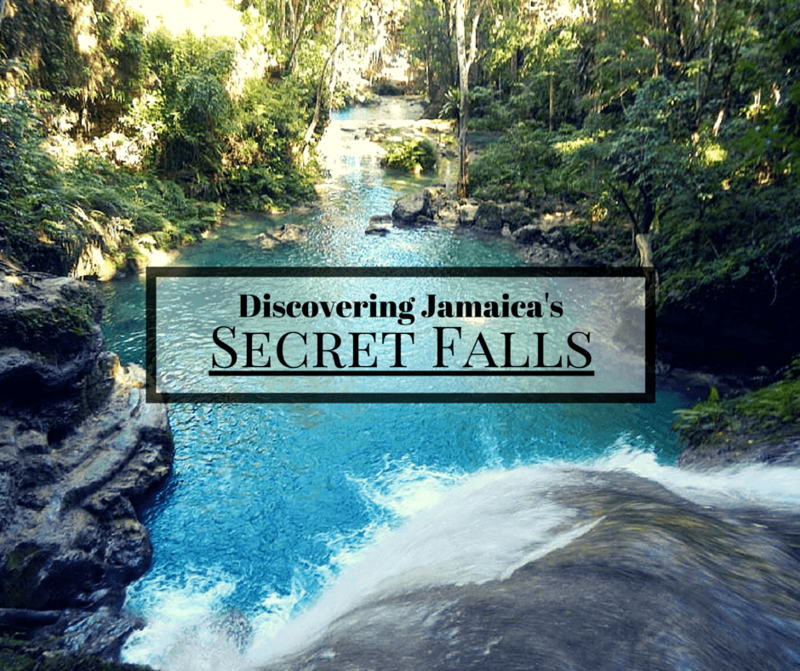 Yes, Dunn’s River Falls can get a bit crowded, so these Secret Falls are a bit calmer. Hope you’re able to make it back one day Mel! I’ve never been to Jamaica, but it looks like such a unique Caribbean island. I would love to go visit this cool island and those waterfalls would be high on my list, that is for sure! Hi Maria! I would really recommend planning a trip. It’s a beautiful island! That place is simply gorgeous. Beautiful pictures!!! So fun and great to have guides to show you all the best spots! The waterfall looks so pretty and who wouldn’t love a rope to swing and jump into the water! Hi Jackie! I had never done it before, so I was a bit nervous. But it ended up being a lot of fun. Glad I did it! What an awesome adventure–looks like a blast! How can you resist a secret waterfall, right?! We always love jumping off cliffs, but have yet to do a rope swing like that. Would love to give it a try sometime! We will definitely have to check this out sometime!! It was my first time jumping off cliffs, but definitely had a blast! Sounds like a perfect day especially while feeling adventurous! I love that you had a guide taking you and helping with pictures. Another side of Jamaica I didn’t know about. Very cool. Hi Elaine! Yes, it was so nice to have someone there to take pictures of us. Too often I find that I barely have any pictures of myself since I’m always the one taking them. How beautiful! I can’t imagine being brave enough to jump off cliffs- but it always helps to have someone trustworthy to guide you. Bookmarked this immediately, I have a soft spot for waterfalls! This looks like SO much fun!! I know my kids would absolutely love this, what a great place. And sounds like you had a really good guide too.